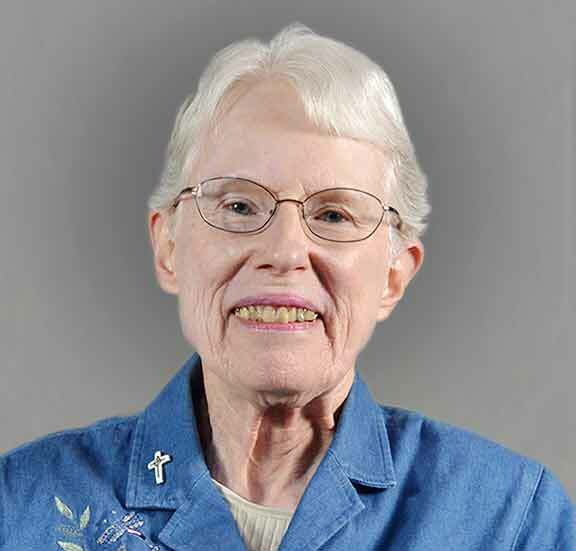 Note: This blog was co-written by Sisters Rosemary Nudd and Ellen Cunningham. 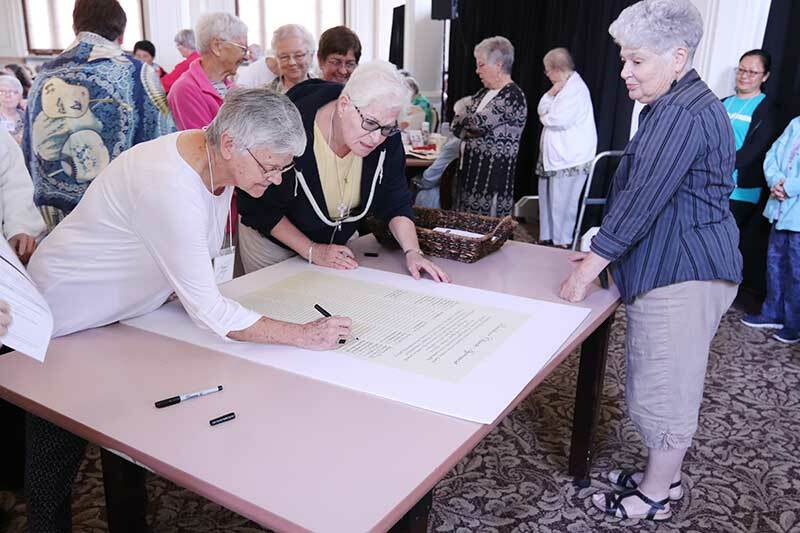 On Monday, July 2, the first day of the 2018 Sisters of Providence Annual Meeting, the Climate Change Task Force provided several hours of activities and reflections. This blog describes the presentation of the Providence Climate Agreement, written by the Climate Change Task Force (CCTF), and the Manifesto which undergirds it. Aaron Copland’s “Fanfare for the Common Man” rings out in O’Shaughnessy Hall: Stark, sharp and arresting. As the trumpet notes fade, we begin our deliberate reading of the Manifesto to the gathering of more than 300 Sisters of Providence and Providence Associates (PA), alternating parts: “Whereas … and Whereas …” and soon different voices in different languages take it up, reminding us in French, Mandarin, Spanish and Tagalog, that our heedless treatment of Mother Earth harms all of God’s creatures, everywhere. Several Sisters of Providence and Providence Associates signed the Providence Climate Agreement during the 2018 Annual Meeting. In response, voices in the room are raised up to speak as one with intensity and reverence: “Mindful of the effects of climate injustice … we commit to work … we pledge to advocate …” Then, in silence made sacred by their communal promise, Sisters of Providence and Providence Associates come forward to sign the Providence Climate Agreement. 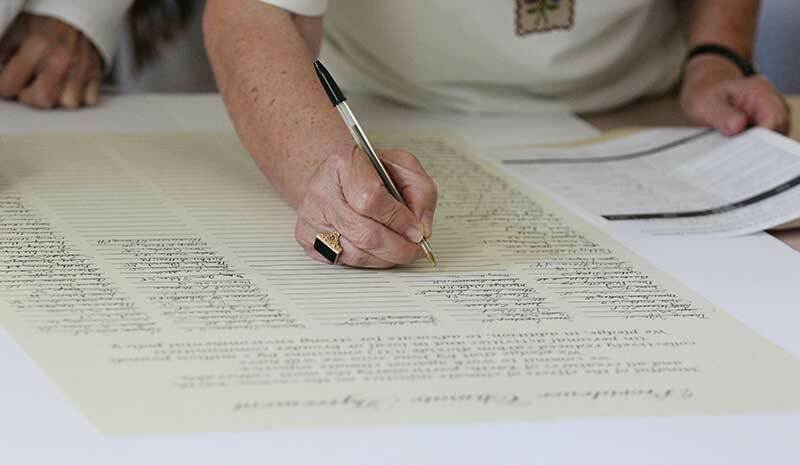 To stand at the tables as the columns of signatures lengthen on the parchment-like scroll is akin to witnessing the signing of Associate commitments or Sisters of Providence vow cards. “I promise,” they attest, “I vow.” The effect is stirring, bringing surprise tears as those gathered stand up and sign up, pledging to be God’s Providence wherever we are: Making choices for the good of the whole … Committing ourselves to our chosen justice focus on the environment. … (Sisters of Providence General Chapter, 2016). We all join in singing “Holy Ground” then, remembering that “our God is present, and where God is is holy.” Energy fills the room, creating its own “Fanfare for the Common Good,” as passion and compassion for Earth, her beauty and her needs are palpable and heartening. And us? Our hearts are full of gratitude and awe, for today, the result of so much prayer, planning, and plain hard work, has exceeded our expectations. Members of the Climate Change Task Force: Co-chairs Mary Lou Dolan, CSJ and Benjamin Kite, PA; Providence Associates Barbara Cottrell, Gene Majewski, Jeanne Rewa, Lorrie Heber; Sisters of Providence Ellen Cunningham, Corbin Hannah, Jeanne Hagelskamp, Patty Fillenwarth, Marilyn Kofler, Rosemary Nudd, Barbara Sheehan, Patty Wallace. Sister Denise Wilkinson (left) and Sister Cynthia Lynge sign the Providence Climate Agreement as Sister Rosemary Nudd looks on.